Endings are hard. Nobody likes to say goodbye, and saying goodbye in a story is especially hard. The pressure is on to get that last part just right and determine how to end a story well. When there are so many possibilities for a conclusion, how do you know which one is right for your story? Before you can choose an ending, you need to figure out what your choices are. Here are a few basic ones to get you started. The classic, feel-good ending. Disney is the master at this. Every character meets their goals (except for the villain, of course), the romantic couple gets together (they might even get married), and you finish the story feeling like you can accomplish anything. This sort of ending goes along best with fairytales and most children’s stories. That’s not to say stories for adults can’t have this kind of ending, too, but it works to perfection when the story already has a light and happy quality to it. You don’t want to write a depressing plot only to wrap it all up in the last chapter. It’ll throw off your reader and make the conclusion seem far-fetched. The protagonist’s main goal doesn’t go as planned, curveballs are thrown, and tragedy strikes. These are tricky to write, because there’s a fine line between writing a tragic, artistic ending and a conclusion that will leave your reader in a hopeless slump. If you’re planning on having an unhappy ending, you’ll need to foreshadow that throughout the story. Have a slightly gloomy, ominous tone from the very beginning. Your reader might not expect it, exactly, but it won’t come as a total shock, making it an easier ending to swallow. But, remember to have some bright moments, little nuggets of happiness the reader can hang onto after the story is finished. This isn’t everyone’s cup of tea, but it’s one of my favorites. The ambiguous ending goes well with an “indie” story. A simple plot—usually something contemporary, but not necessarily—works best, because it focuses most on the characters, leaving a lot up to the reader’s imagination when it comes to what happens after the story is finished. If you do decide to go with this ending, remember that there’s a huge difference between ambiguity and unfinished business. If you drop the plot too suddenly, the reader wonders if there are pages missing from the end of the book, if something’s gone wrong. What you want to do is drop enough hints that someone can come close to determining what will happen, but they’ll never know for sure. There’s a difference between an ambiguous ending and unfinished business. Sometimes this can even pair with the ambiguous ending, but it doesn’t have to. This conclusion might look like the protagonist failing to meet their goal, but finding something else along the way. Maybe the main couple doesn’t get together, but they’ve found happiness apart from each other. Make the ending unexpected, but hopeful. The reader will be pleasantly surprised and leave the story with a sense of calm and satisfaction. Maybe you knew how your story would end when you started writing it. Maybe you’re on the next-to-last page and you still don’t know. 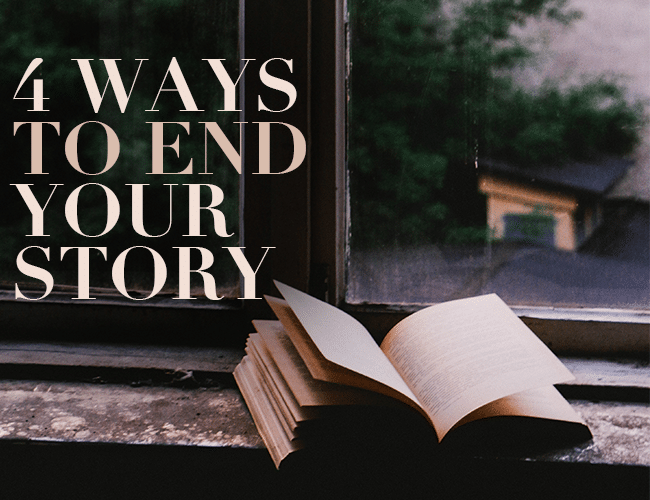 Whatever the case, these four options for how to end a story can get your imagination flowing. How will your story end? What’s your favorite ending in a story? Why do you like it? Let us know in the comments. The lizard was enormous, at least three feet long. It also wasn’t in its tank. Write the conclusion before you write anything else. Write for fifteen minutes. When you’re done, if you’d like, share your ending in the comments. Be sure to give your fellow writers some feedback, too. Have fun!